ABOLITION OF CAPITAL PUNISHMENT: Malaysia should rethink holistically and practically and take the lead and be the proponent in Asean countries to implement this. THE death penalty is prescribed for several offences, ie murder and waging war against the King (offences under the Penal Code), kidnapping for ransom (an offence under The Kidnapping Act 1960 as opposed to simple kidnapping under the Penal Code), drug trafficking (offences under the Dangerous Drugs Act 1952 and other related drug statutes), certain scheduled offences for activities in relation to possession of firearms and ammunition or explosives [offences under the Firearms (Increased Penalties) Act 1971(FIPA)] and under the Internal Security Act 1960 (ISA) the latter of which was repealed recently. Most of the death penalties are mandatory upon finding of guilt. This means the trial judge has no discretion in sentencing to consider a range of possible sentences such as life imprisonment or a prescribed jail sentence which could run up to the maximum sentence, being the death penalty, which of those is most suited to be handed down on a convicted person after considering the myriad circumstances in relation to the commission of the offence and/or the offender. The Malaysian legislature used to entrust judges with this important discretionary function. For instance, we used to give this sort of discretion to the High Court judges in drug trafficking matters. But a previous attorney-general was frustrated with the fact that judges were opting to sentence certain drug trafficking convicted offenders to life imprisonment rather than mete out the death penalty. Those judges had good reasons in most cases for opting out of the death penalty. In any case, if the judges were wrong there was always the appellate process which the prosecution could resort to press their point for the capital sentence. But immaturity and myopic considerations seemed to have prevailed then. We have been stuck with this knee-jerk culture of our legislature, a legislature that is not well advised by the parliamentary draftsman and other relevant authorities. As a result amendments made were jaundiced and lack cohesion with the general scheme of the system. Back in 2008 or so, the secretary-general of the Foreign Affairs Ministry, in an important speech at the United Nations said that the Malaysian government was considering steps to abolish the death penalty. It would be done incrementally. I would have thought that the first step was to return the discretionary power to the judges on all offences, especially drug trafficking cases. Singapore has just amended its law to reflect this on drug trafficking cases and a category of murder cases only and they apparently wanted to coordinate that important move for change with Malaysia. As always, we allowed Singapore to steal the thunder from us when we did nothing to implement that idea for the change although the Attorney-General's Chambers claimed they had been toying with some connected ideas and research about a year earlier. Singapore now seems to have a slightly more liberal and just sentencing principle in drug trafficking cases than us! What an irony! My colleague, senior lawyer Roger Tan made this point in his recent article. Malaysia should rethink holistically and practically the whole debate on the abolition of the capital punishment and not merely on abolishment of the mandatory death penalty and take the lead and be the proponent in Asean countries to implement this actively. As a Malaysian representative in the Asean Intergovernmental Commission on Human Rights, (AICHR), I have mooted this idea on several occasions among my colleagues in AICHR for all the 10-member Asean countries to consider. Not so long ago, the de facto law minister had said Malaysia might not be ready to abolish capital punishment. Apparently, according to him, the majority of Malaysians are against such abolishment. Of late the minister is proposing the idea of abolition of the mandatory death sentence in drug trafficking cases. This is the exact idea of the current law in Singapore. Yet in our country, we take a longer time to consider this obvious reform when we could have taken the lead. Tan Sri Lee Lam Thye recently gave a dampening view and advocated against abolition of the death penalty. I have several issues with Lee's observations. Firstly, and with all due respect, I think that he may have misunderstood the minister. He was not talking about abolition of the capital punishment altogether. He was only referring to removing the law on mandatory capital punishment and even then it was restricted to drug offences only. While I support the idea of immediately removing the mandatory capital punishment in drug cases, I am proposing that this should be merely a beginning of the migration of our laws towards the incremental and eventual total abolition of the death penalty. I propose we consider the following steps. FOURTH, at an appropriate time after the three years from the first step (but no longer than five years) capital punishment should be removed even in the two offences of waging war against the King and kidnapping for ransom. In other words , at the end of the third year from the first step, only two types of cases continue to attract the death penalty but on a non-mandatory status until further liberalisation as suggested above. The reason I attribute seriousness to the two categories of cases is solely on grounds of public revulsion and public policy and the heinous nature and the presence of the element of extreme cruelty potentially surrounding the circumstances of such crimes. These two crimes are normally executed in the coldest, calculated and planned methods and have intimate nexus to violence. It is almost always carried out by gangs and syndicates normally associated with organised crimes or subversive elements. Crimes associated with drug trafficking range from syndicated organised crimes to mere individual carriers or mules and are solely driven for profit. The lack of distinction between "hard" and "soft" drugs and between true traffickers and mere mules' in the Malaysian law, doubles the complications in sentencing. 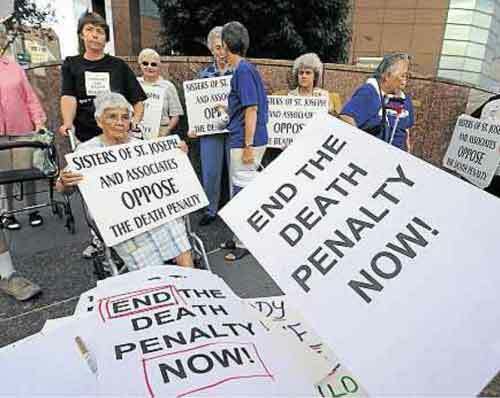 THE death penalty does not reduce specific crimes such as drug offences, murder etc. All the above reasons are sound and reasonable.